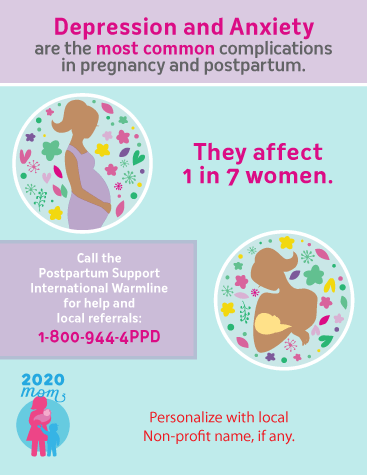 Women should be informed of MMH disorders and be assessed for risk prior to pregnancy, and screening and support should be provided throughout the perinatal period. The Task Force documented the following critical timeframes which require assessment, screening, and support from health care providers and the specific actions for each provider type. 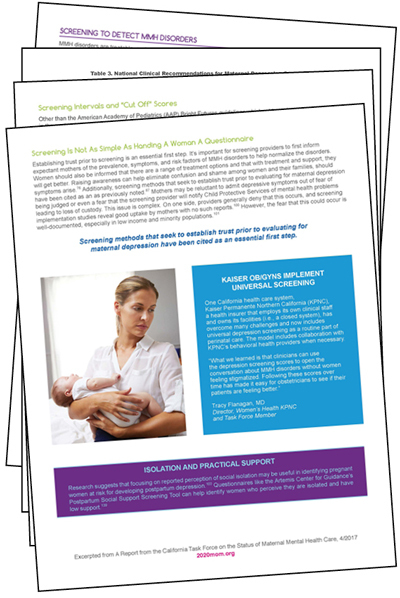 Help patients and customers learn more about maternal mental health. 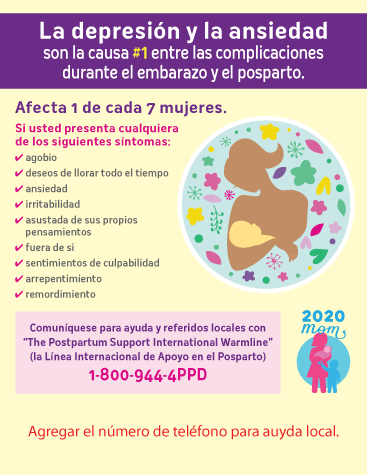 Use these posters, flyers, and awareness cards (business-card sized cards) in your facility. Also, purchase general awareness and survivor merchandise below. Posters can be printed on standard 8 1/2" x 11" paper. You can even personalize them with your own logo and text if you choose. To personalize, download the file and place it in a letter size document as a picture. Adjust the pdf to fill the page. Now place a text box and/or your logo in front of the poster image. Don't have a color printer? These files can be used to order from your favorite printer. 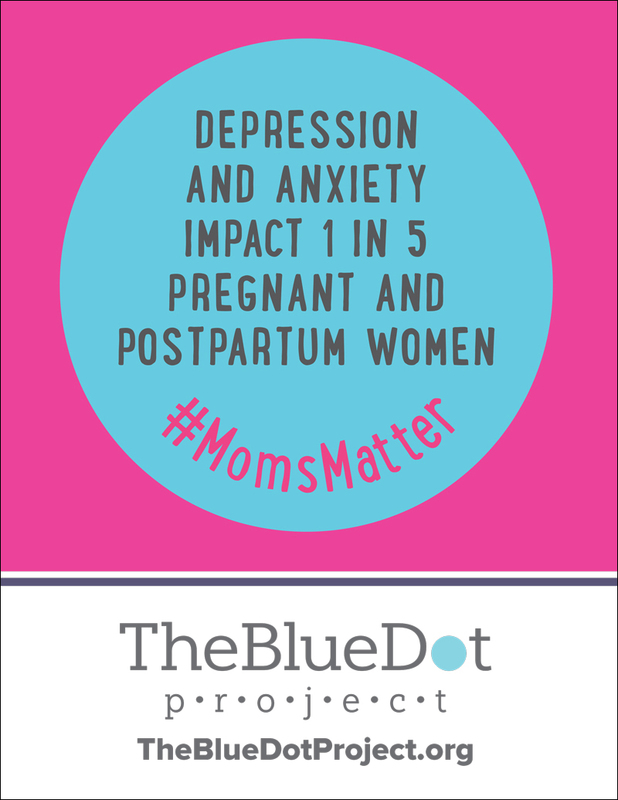 BlueDot signs can be used at awareness walks, lobby days, maternal mental health month events and more. Great tools to use to distribute important information! Share these palm cards with women of child bearing age and others at awareness walks, health fairs, house parties and more. These materials can be downloaded to order from your favorite printer. Includes prevalence, signs and symptoms and PSI hotline to call for help. Download these business card size files to order through your favorite printer. 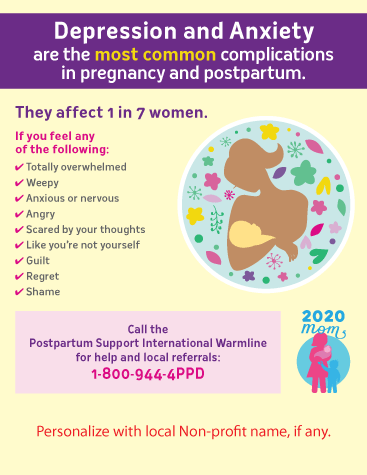 Includes steps expecting and postpartum women can take to reduce risk of anxiety and depression and treatment options if signs and symptoms arise. Download these folded business card size files to order through your favorite printer. Contact Joy@2020mom.org to request your custom version. Download these files to order through your favorite printer. These materials have been developed by other national organizations that we we think you'll love as much as we do. -Antidepressant Use in Pregnant and Breastfeeding Women. -Making Peace with Your Birth Experience. -Exercise as a Treatment for Depression in New Mothers: Yes, You Can Exercise Instead of Taking Antidepressants. -9 Stupid Things that People Say to Women Who’ve Experienced a Traumatic Birth. -Can Fats Make You Happy? Omega-3s and Your Mental Health: Pregnancy, Postpartum, and Beyond. -Vitamin D and Its Surprising Link to Perinatal Depression, Health Disparities, and the Health Impact of Adversity. -How Other Cultures Prevent Postpartum Depression. Social Structures that Protect New Mothers’ Mental Health. -Should Mothers Avoid Nighttime Breastfeeding to Decrease Their Risk of Depression? -Bright Light Therapy Treats Depression in Pregnant and Postpartum Women. -7 Unhelpful Things People Say to Women about Breastfeeding Following Sexual Abuse. visit the MMH Collaborative Gift Shop! 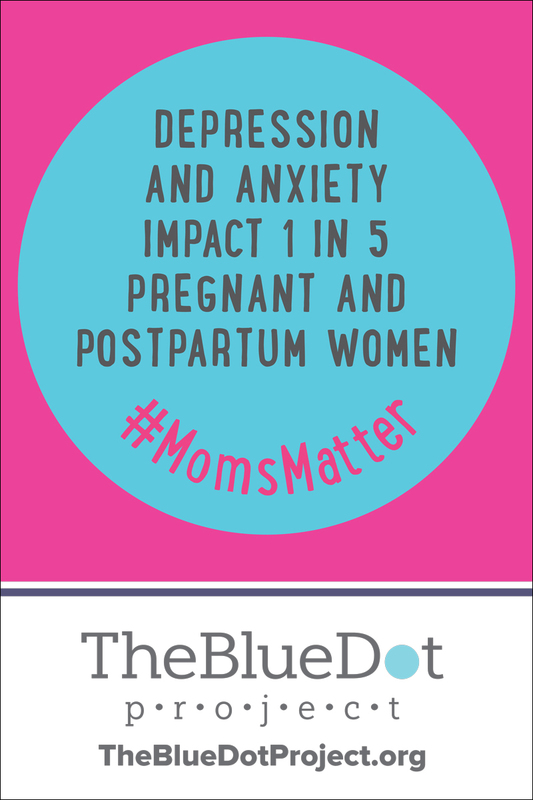 Visit the Blue Dot Shop for a variety of Maternal Mental Health merchandise.